DURMAX Steel Grinding Media is made for maximum durability due to our Cold Heading manufacturing process. DURMAX beads are NOT cut from wire and rolled like other media. 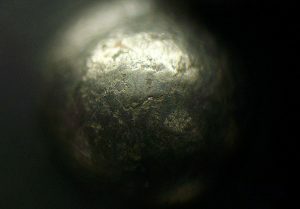 Cold Heading shapes the ball into a roughly finished size leaving only de-flashing and polishing operations. Cold Heading virtually eliminates all fissures and cracks which lead to bead fragmentation and reduced wear resistance. Cold Heading may cost slightly more than a bead made from a cut wire process, but the result is a media that lasts longer. DURMAX media surface finish is free of cracks and fissures for minimal splitting and higher wear resistance. 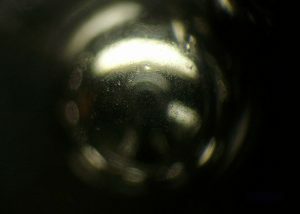 The difference is visible even under low magnification. Hardness tolerance is strictly controlled to eliminate “overhardening” which leads to brittle material and splitting. DURMAX Chrome Alloy beads and Stainless Steel beads are through-hardened. 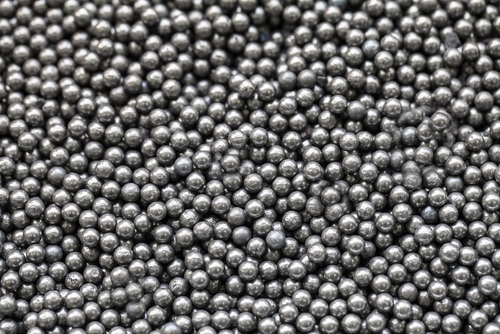 Carbon steel beads are Case-Hardened to 1/2 diameter, not 1/4 diameter like other brands. DURMAX beads have a size tolerance of +/- 1% of diameter, NOT 10% like other beads. Cylindrical slug is cut with length shorter than finished ball diameter. Finished ball diameter is shown by red circle. DURMAX Steel Shot is a drop-chilled shot which undergoes extra processing to eliminate as many odd shaped pieces as possible. Most pieces with voids, tails or hollows are removed. Steel Shot is heat treated for slightly higher hardness. Sizes range from 0.1 to 4 mm. Hardness is R55-60C. Packing is in 50 lb. bags. Bulk density is 4.6 g/cc. Specific Gravity is 7.85 g/cc.